Many opposition parties were vitriolic targeting that the decision of cabinet ministers’ dismissal by state government was a new drama; but the real cracks surfaced after refreshing the grudge between Akhilesh and Shivpal Singh. The chief of Samajwadi Party, Mr Mulayam Singh Yadav appointed Shivpal Singh as the state president, which ired the CM. Akhilesh sacked the two cabinet ministers; said goodbye to the state chief secretary; and stripped even the charge of many departments from Shivpal. The efforts of meeting and tension in politics of UP, Shivpal Yadav has resigned from the post of cabinet minister and state president of party. He submitted his resignation letter to CM Akhilesh on Thursday late evening, while the meetings had held in Lucknow and in Delhi whole day in many rounds after the resignation came. After bitterness it was first 15 minutes meeting between Shivpal Yadav and Akhilesh Yadav. Shivpal said, “Whatever say anybody, but the decision is mere taken by the chief minister.” He told Akhilesh that nobody else but Mulayam Singh had made unilaterally Amar Singh Lawmaker. Shivpal was soft after meeting with Mulayam in Delhi, but the step of resignation by Shivpal is surprising in this respect. Mulayam had said with Shivpal that Shivpal would not resign from post of ministership. Akhilesh Yadav, the CM, reached to meet with party chief and his father Mulayam Singh late evening exactly before Shivpal’s resignation. 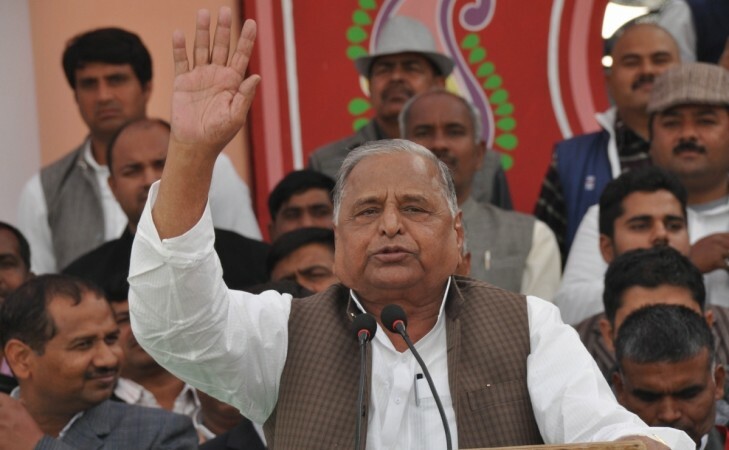 Mulayam Singh to protect the division in the party he deduced the formulae of organization and the government. According to this idea, Akhilesh will be election brand and the government will run by his directives; while Shivpal will work for party and the government. The bitterness and conflict rise so much that the preach of Netaji was rejected. The situation that comes forth shows: the control of Mulayam Singh over Samajwadi party has been out. 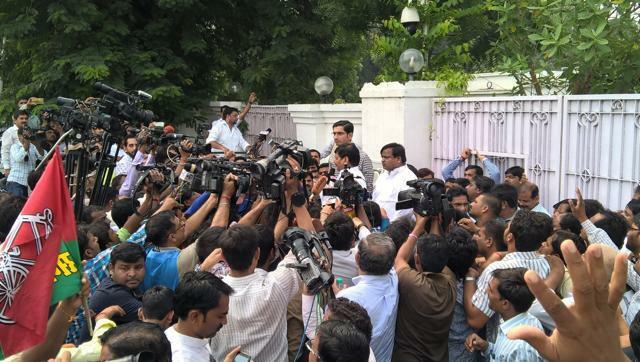 The news of resignation as spreaded, the supporters’ gathering surged outside his residence and began shouting of slogans ‘Shivpal yadav Sangarsh karo’. Shivpal said with the supporters he would talk them (next day) on Friday; please go back to their homes. The anger among the supporters was seen, and the legislatures reached to meet with him at the residence; but they were returned to homes after his statement to wait till next morning. The defiant mood of Shivpal surfaced two faces of the supporters in a party. The crowds outside his residence were seen in surge. The party will remain unite till he is here: this sentence has the gist of the fresh event. Actually NetaJi is saying that the command of the party is in his hand, and he is doing arrangement very carefully after his term. Mulayam to satisfy the senior party leaders and family kept on giving the ministries to maintain peace in the party as they had desired; and saved Akhilesh from endangers. The family is asking now their benefaction in the coming assembly election. Everyone require its package of tickets. The ticket distribution has the economic side, and to maintain the political ambitions in the party have to proliferate supporters — which is very tough task.